My name is Eric Schauvinhold @ericschauvinhold, I'm from Argentina 🇦🇷 and I'm 24 years old. When I was 17, I was in a car addident leaving me with a spinal cord injury at T4 level. It was realy hard to accept that I was gonna be in a wheelchair the rest of my life, but I keept pushing. 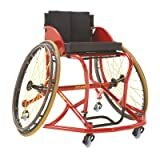 Now, I'm a doctor and play wheelchair Basketball for national team. Keep your head up and your heart strong.